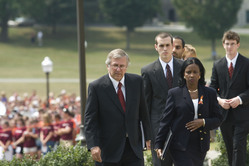 BLACKSBURG, Va., August 15, 2007 -- To coincide with the start of the new academic year, Virginia Tech will dedicate the memorial to the victims of April 16 on Sunday, August 19 at noon. 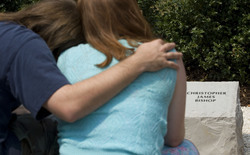 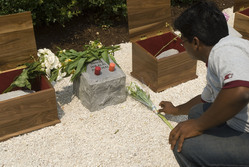 After the memorial dedication ceremony on August 19, 2007, an unidentified man examines Michael Pohle&#39;s Hokie Stone. 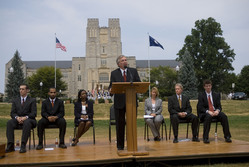 Media presence at the memorial dedication ceremony on August 19, 2007. 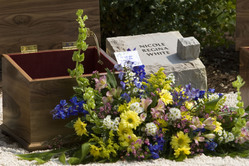 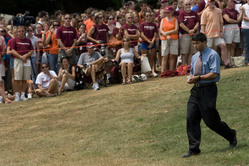 Virginia Tech Professor Vinod Lohani carries one of the victim&#39;s Hokie Stones back to the seating area during the memorial dedication ceremony on August 19, 2007. 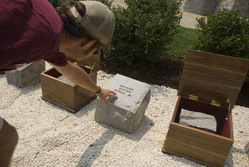 Two unidentified visitors observe Jamie Bishop&#39;s new hokie stone on August 19, 2007, the day of the memorial dedication. 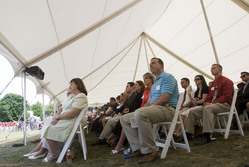 View from inside a large tent, reserved for friends and family of the victims, at the memorial dedication ceremony on August 19, 2007.